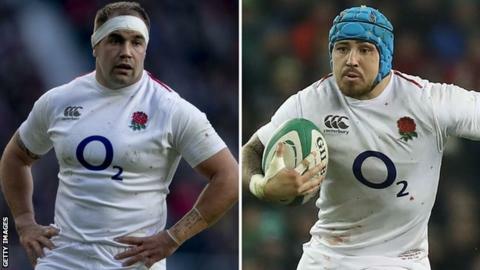 Prop Ben Moon and wing Jack Nowell both start for England as head coach Eddie Jones makes two enforced changes for Saturday's Six Nations showdown with Wales in Cardiff. With Mako Vunipola injured, Moon is named in the starting XV with Ellis Genge on the bench. Nowell comes in for Chris Ashton, who has been ruled out with a calf problem. Wing Joe Cokanasiga and flanker Brad Shields, who have not featured so far in 2019, are among the replacements. "England and Wales is always a big game - intense rivals and there is the historical context to it - but for us it is our most important game because it is our next game and that is how we are treating it," said head coach Jones. England have chosen to have the Principality Stadium roof open for the match. Wales secured a famous 30-3 win with the roof closed in 2013, but were denied their wish to play every match indoors in the 2017 tournament. England started their campaign with a famous win against Ireland in Dublin, before backing that up by thumping France at Twickenham. But Saturday's match against an unbeaten Wales will be their stiffest challenge yet, according to Jones. "It's all about Wales, we are playing potentially the greatest team ever," he said. Shields is preferred to Nathan Hughes among the replacements with Jones expecting a "high work-rate game". "Whenever you play against a Warren Gatland side you are playing against a side that is going to be very physical on the gain line," Jones added. "They are always very fit so you have to make sure you win the gain line and then find opportunities of where you are going to attack them." With Nowell a shoo-in to replace the injured Ashton, the only tough call for Jones was at loose-head prop where Ben Moon is tasked with replacing Mako Vunipola and Ellis Genge will provide energy off the bench. Despite England being favourites after their two impressive displays so far, Jones has continued his quest for the underdog tag. He insisted that Saturday is all about Wales, that England are facing the greatest Wales team ever and that it will be the biggest day of the Wales players' lives. England team to face Wales: Daly; Nowell, Slade, Tuilagi, May; Farrell, Youngs; Moon, George, Sinckler, Lawes, Kruis, Wilson, Curry, B Vunipola.